Along with Ferris Bueller and Dazed and Confused, 1989's Bill & Ted's Excellent Adventure is on my "Most Watched Shelf" of VHS cassettes that I'd be happy to play at any time. The time-bending comedy is unarguably Keanu Reeves best work as an actor, and I loved the late, great George Carlin in a rare movie appearance. But after the lackluster - but still campy and enjoyable - sequel Bill & Ted's Bogus Journey came out in 1991, and the ill-advised cartoon and live-action series were cancelled, it seemed that the burgeoning franchise was set to fade into obscurity. But here we are, 20 years after Bogus Journey was in theaters, and Keanu Reeves is still talking about a third Bill & Ted's film. The premise would once again place Keanu as Ted "Theodore" Logan and Alex Winters as Bill S. Preston, Esquire with their super-band Wyld Stallyns still trying to write the song that will save the universe - even as the rockers are deep in their forties. Reeves told MTV recently that he has been meeting regularly with the original screenwriters - Chris Matheson and Ed Solomon - on drafting a script. "When we last got together, part of it was that Bill and Ted were supposed to have written the song that saved the world, and it hasn't happened," Reeves said. "So they've now become kind of possessed by trying to do that. Then there's an element of time and they have to go back." That's all well and good, I suppose, but when can we expect the script to be finished. "I believe the writers are six weeks away from a draft," Reeves said. "No pressure!" 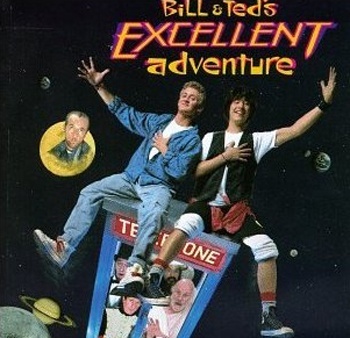 Will we really see another Bill & Ted's movie starring the original duo in their 40s? If the script's good enough, it's possible that a production company might greenlight it considering how "reboot happy" Hollywood is right now, especially with 80s IPs. The sad part is that George Carlin won't be around to reprise his role as Rufus. Alex Winters mentioned last year that it was something that he and the screenwriters lamented. "It's actually stopped us in the past - why do it without Rufus? We've been delicate about moving around him," Winters said. I just hope they let the Rufus character die gracefully instead of casting somebody new in the role.